Experts say that individual and team motivation is the leading factor affecting the productivity of a project team. There are a few steps the Project Manager should take to ensure that the foundation of sound motivation is in place in the project environment. In 1985, I had an assignment to select videos for a training program for front-line supervisors in an engineering services company. I watched many videos on hiring interviews, performance evaluations, discipline, and motivation. On the subject of motivation, I viewed a number of videos and then reviewed them in my mind to see which one to pick for our training course. I was surprised to observe that they all said essentially the same thing. There are three things required to have a motivated employee: first, provide clear ownership of a defined task; second, ensure the person has the ways and means to do the task; and finally, follow-up with timely feedback and hold the individual accountable for results. The more I use these three steps, the more profound, powerful, and simple they become to me. I've packaged this information as "the motivation triangle," to help make it easy for people to remember and apply. Much of my work as a project manager involves applying the motivation triangle throughout the day. I make sure everyone has work to do. Do they have enough assignments in their queue so they have something to work on if they hit a road block or get bored? Are their tasks well defined? Do they know what the results should look like? After that, I make sure they have the wherewithal to accomplish their tasks. Do they have the tools and training? Do they have the ways and means to accomplish the task? Do they need help? Do they need me to make any phone calls to get information, tools, or assistance? If they have all they need, then I leave them alone to do their work. I make sure we agree on what results are expected, but I try to let them decide how they want to do it. A few days later, I'll drop by and say, "How's it going?" Then is the time to praise good quality work, done on time, and to encourage better performance if progress seems inadequate. This might be formalized as a weekly review of task status, to update schedules and assess earned-value or task percent complete. More than 9 times out of 10, this simple process will produce motivated workers. The ones who do not respond to this are special cases that need to be handled through a formal process of performance counseling. The idea of giving people clear task ownership is VERY important in project work. 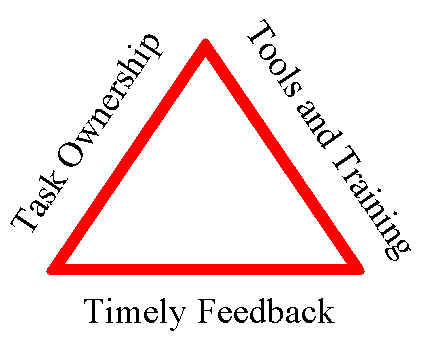 The motivation triangle applies to managing project managers as well as to managing team members. It even applies to managing whole organizations! Recently I was working on a presentation that addressed what it takes to deploy project management methodologies in organizations. A methodology implementation requires three indispensable components. It must address "what" should be done on projects, that is, it must prescribe policies and practices to be used in the project environment. Next, it must address "how" the practices should be applied. This may involve definitions, instructions, training, and help (forms, examples, templates, systems, data). The final part required is management FOLLOW-UP. Without follow-up, project management, and specifically implementation of project management disciplines in organizations, is just not going to happen (because it requires significant effort and resolve). It turns out that the motivation triangle applies here too. To implement a methodology, you have to tell the organization what is expected of them. Next, you need to provide the tools and training so they can do what is expected. And finally, you need to have management follow-up to monitor the success of the implementation and to hold people accountable for doing what is required. When organizations have problems with projects, many organizations try to address it superficially by buying copies of Microsoft Project software or sending people to get training in Project Management 101. This is not an effectual way to improve project performance. Why? This is addressing the second leg of the motivation triangle before the first leg. It is giving the troops the ways and means before they know what their responsibilies are. I've taught project management courses to people in companies where the people said, "We don't know why we are here." The training was just a frustration for them. The policies and practices need to be prescribed first. Then people can be profitably taught how to fulfill their responsibilities. Worst Practices - To Avoid! Make it unclear who is responsible for tasks; don't trust anyone with clear ownership, but ask several people to get the job done. Keep yourself very busy, so team members will see how valuable you are, even if you have no time to supervise their assignments, solve problems, or monitor work methods. Assign new team members to tasks without adequate task definitions, guidance or training; use the sink or swim method for work assignments. Let poor performers continue without comment, and ignore gossip and dissension among project team members. Reward your excellent performers by giving them an impossible workload; let them be the heroes to carry the project on their backs. I'm not trying to be negative or sarcastic here, but it is sometimes helpful to describe negative behaviors we want to avoid to help us recognize them and not fall into the traps. Projects are often stressful and hectic. It is hard to keep focused on what is important. It is normal on a stressful project for the Project Manager to have that glazed look of the deer caught in the headlights. The best way to cope with this is to rely on fundamental principles, to define achievable objectives, and focus on short-term successes. What needs to be done? Understand and document the requirements. How will we do it? Prepare a reasonable plan. Assign staff ownership of tasks. Make sure they have good task definition and the ways and means to accomplish the work. The best feedback is success, so structure your project to be an endless series of little successes. On a challenging project, managing by mini-milestones is the only way to keep things moving. You could have a success every few days. Then celebrate and move on. Mini-milestones can lead to eventual project success if they are chosen well. This means that every significant task will be structured as a mini-milestone with criteria for determining when it is done. For projects to succeed, the goals need to be well defined and clearly communicated to the project team. If definition and communication do not occur, successful project completion becomes a random stroke of luck (the odds of which are akin to winning the lottery). Effort engaged with poorly defined targets is futile and, consciously or not, the whole project team will sense this. An incomprehensible or unachievable goal lowers morale and kills enthusiasm and motivation. This, in turn, affects the quality of the work and further lowers chances of success. In addition to the benefits of having highly motivated individuals on your project team, there is an additional opportunity for increased team motivation and productivity. When building the project team, make sure people are committed to working hard for the team to succeed. Job satisfaction and career growth are often important goals for project team members. Find out what each team member win conditions are, and try to make these part of the project goals. When you are able to get your project staff to work well together towards a challenging goal (ideally in groups of 7, plus or minus 2), a real team may emerge. When a team gels, it can go way beyond a mere group of people. Team synergy transcends the mundane. It is supercharged. Not only does this produce high performance for the project, it also provides a genuinely satisfying human experience for the team members. Creating an environment in which such a team can gel is one of the ultimate goals of the Project Manager. © Copyright 2001, James R. Chapman, All rights reserved.